The Philippines says it will challenge Chinese territorial claims in the South China Sea at a UN tribunal. 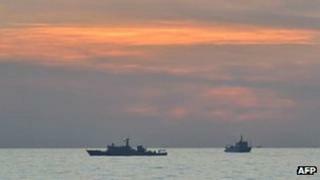 Foreign Secretary Albert del Rosario said the decision came after Manila had exhausted "almost all political and diplomatic avenues" to resolve the maritime dispute with Beijing. He said he hoped arbitration would help bring a "durable solution" to the row. Tensions between the two have been high since a stand-off at the Scarborough Shoal - which both claim - last year. China claims a U-shaped swathe of the South China Sea; its claims overlap those of several South East Asian nations. In a statement, the Chinese ambassador to Manila reiterated Beijing's position and "stressed that China has indisputable sovereignty over the islands in [the] South China Sea and its adjacent waters", according to the AFP news agency. "The Chinese side strongly holds the disputes on [the] South China Sea should be settled by parties concerned through negotiations," Ambassador Ma Keqing added. In recent months Beijing has taken a more assertive posture on the issue, leaving ties with both the Philippines and Vietnam severely strained. In a statement, Mr del Rosario said his office had summoned the Chinese ambassador in Manila to inform her of the move. He said Manila would take Beijing to an arbitration tribunal under the United Nations Convention on the Law of the Sea (UNCLOS), which both had signed. He said in its submission, the Philippines had asserted that China's "nine-dash line" setting out its claims in the region was unlawful under UNCLOS. China had "interfered with the lawful exercise by the Philippines of its rights within its legitimate maritime zones", it went on. It said the Philippines wants the tribunal to declare China's nine-dash line invalid. "We strongly believe that this action is the appropriate response to put our diplomatic relations in its proper context," Mr del Rosario said. The Philippines said it expected legal proceedings to take between three and four years, based on previous cases. Signatories to UNCLOS are obliged to go through an arbitration process in the event of a dispute with another party and to accept the resulting settlement, UNCLOS says on its website. However, an exception is made where issues of national sovereignty are at stake. The Philippines is taking a risk with this move, says the BBC's Kate McGeown in Manila. It knows China will not like it and it is increasingly dependent on China economically. But it also wants to safeguard its claim to what could be lucrative oil and gas reserves in the South China Sea, our correspondent says. The row between Manila and Beijing has been rumbling since April 2012, when government vessels from both nations faced off for several weeks at the Scarborough Shoal. Since then both the Philippines and Vietnam - which is in dispute with China over the Paracel islands - have sought to raise the issue through the Asean regional bloc, but claim Chinese pressure has forced the topic off the agenda. China has in the past preferred to handle disputes on a bilateral level, rather than through regional groupings or international organisations. China's claim includes almost the entire South China Sea, well into what UNCLOS recognises as the 200-mile-from-shore Exclusive Economic Zones of other claimants. As well as the Philippines and Vietnam, Brunei, Malaysia and Taiwan have overlapping claims.